Intensive treatments such as primary androgen deprivation therapy (pADT) plus docetaxel or abiraterone acetate are reportedly beneficial in metastatic prostate cancer (mPCa) patients with high-volume disease or high-risk features, respectively., High-volume or high-risk features are determined exclusively via pretreatment parameters. Predicting patient responsiveness to pADT, which is one of the major determinants of survival in these patients, would be advantageous with regard to making primary treatment decisions. If an initial 3-month period is possible, short-term serum parameter dynamics can be used to predict pADT responsiveness. Prostate-specific antigen (PSA) and alkaline phosphatase (ALP) dynamics have been indicated as potential predictors., Although pADT can reportedly cause a 20%–30% decrease in adrenal androgen levels, it is not known whether the dynamics of adrenal androgens shortly after the initiation of pADT can predict pADT responsiveness. The aim of the current study was to identify predictors of pADT responsiveness among pretreatment parameters and 3-month dynamics (D3m) of serum parameters including the adrenal androgen, dehydroepiandrosterone sulfate (DHEAS). From May 2013 to April 2016, 32 patients were diagnosed with mPCa and treated with pADT comprising a gonadotropin-releasing hormone agonist or antagonist with bicalutamide (80 mg day−1) or not. Serum DHEAS levels (median: 130 μg dl−1, range: 15–360 μg dl−1) were measured as reported previously, and the range of 5–313 μg dl−1 in the study population was normal for age (median: 72 years, range: 52–89 years). Time to development of castration-resistant prostate cancer (TTCRPC) defined in accordance with the Prostate Cancer Working Group 2 criteria was used to evaluate pADT responsiveness. The parameters analyzed were the presence of visceral metastasis, presence of ≥4 bone metastases with ≥1 beyond the vertebral bodies and pelvis (hereafter referred to as “high-volume bone metastases”), presence of Gleason pattern 5, and D3m of ALP, PSA, testosterone, and DHEAS. D3m-ALP was defined as the presence of a transient increase to 120% or more of baseline followed by a subsequent decrease to equal or less than baseline (ALP bouncing). D3m-PSA was defined as PSA ≤0.2 ng ml−1 within 3 months, and D3m-testosterone was defined as testosterone <3 ng dl−1 within 3 months. With regard to D3m-DHEAS, a normal pattern of DHEAS change was defined as 3-month DHEAS levels divided by baseline DHEAS level within its interquartile range (IQR;first quartile 58%, third quartile 94%). Relationships between the parameters and TTCRPC were evaluated using a Cox proportional hazards model-based multivariate analysis. Castration-resistant prostate cancer (CRPC)-free survival curves were generated using the Kaplan–Meier method with differences assessed using the log-rank test. D3m-DHEAS and D3m-PSA capacities to predict CRPC development within 12 months were assessed using area under the receiver operating characteristic curve. All statistical tests were two-tailed, and P < 0.05 was considered statistically significant. All statistical analyses were performed using JMP software (ver.13.2.0, SAS Institute, Cary, NC, USA). The study protocol was approved by the Saitama Medical Center review board (Kawagoe, Saitama, Japan; submission number 771), and all patients provided written informed consent. During a median of 32-month follow-up period, 25 patients developed CRPC, with a median of 9.5-month TTCRPC. There was a median 27% decrease in DHEAS levels after 3 months of pADT, which is concordant with a previous report. 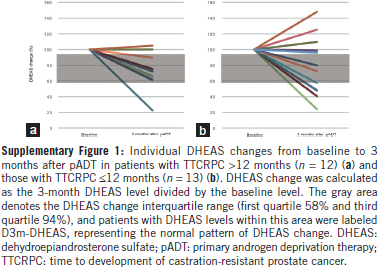 Individual DHEAS changes from baseline to 3 months after pADT in patients with TTCRPC >12 months and in those with TTCRPC ≤12 months are compared in [Supplementary Figure 1 [Additional file 1]]. Multivariate analysis identified D3m-PSA (hazard ratio [HR]: 0.093, 95% confidence interval [CI]: 0.005–0.578, P = 0.008) and D3m-DHEAS (HR: 0.327, 95% CI: 0.112–0.901, P = 0.031) as statistically significant and independent predictors of TTCRPC [Supplementary Table 1 [Additional file 2]]. Patients with a normal DHEAS change pattern had a statistically significantly higher CRPC-free survival rate than those with an aberrant DHEAS change pattern, which was defined as any DHEAS change pattern other than a normal pattern (P = 0.007; [Figure 1]. Predictability of developing CRPC within 12 months was compared using area under the receiver operating characteristic curve analysis, and D3m-DHEAS outperformed D3m-PSA (0.818 vs 0.603, P = 0.027; [Supplementary Figure 2 [Additional file 3]]). 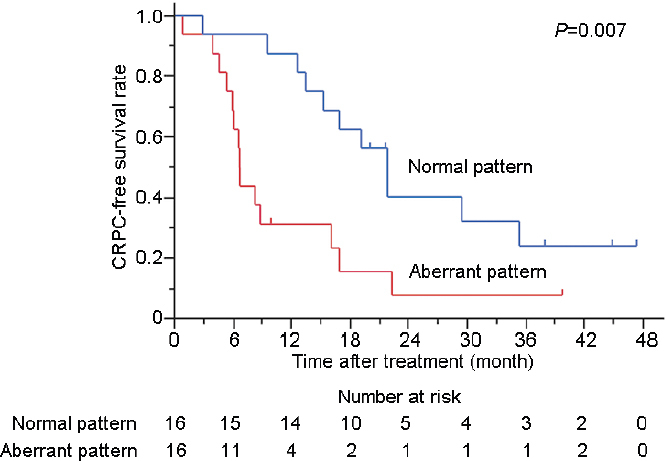 Figure 1: CRPC-free survival predicted by DHEAS dynamics. A normal DHEAS change pattern was associated with statistically significantly more favorable CRPC-free survival than an aberrant pattern (P = 0.007). CRPC: castration-resistant prostate cancer; DHEAS: dehydroepiandrosterone sulfate. The present study demonstrated that DHEAS dynamics can predict CRPC-free survival in patients with mPCa treated with pADT. To our knowledge, this is the first study suggesting that adrenal androgen dynamics can predict TTCRPC in mPCa patients. Although the mechanism(s) underlying the association between aberrant DHEAS change pattern and androgen deprivation therapy resistance remain unclear, one possibility is the involvement of elevated 3β-hydroxysteroid dehydrogenase activity, which promptly metabolizes DHEA to dihydrotestosterone, leading to a relatively rapid change in DHEA level in prostate cancer cells. Few recent studies have reported possible relationships between androgen dynamics and prostate cancer outcomes. Yamamoto et al. reported that testosterone reduction of ≥480 ng dl−1 was associated with favorable overall survival in men with hormone-naïve PCa despite the speed of the reduction. The main limitations of the present study were the small cohort size and the relatively short follow-up period. Future prospective studies with larger cohorts are needed to confirm our results and to identify new associations. AY conceived and designed the study, performed the statistical analysis, and participated in drafting the manuscript; SK interpreted the data and participated in drafting the manuscript; MK, HT, YO, and MM collected the clinical data and revised the manuscript. All authors read and approved the final manuscript, and agreed with the order of presentation of the authors. Fizazi K, Tran N, Fein L, Matsubara N, Rodriguez-Antolin A, et al. Abiraterone plus prednisone in metastatic, castration-sensitive prostate cancer. N Engl J Med 2017; 377: 352–60. Hussain M, Tangen CM, Higano C, Schelhammer PF, Faulkner J, et al. Absolute prostate-specific antigen value after androgen deprivation is a strong independent predictor of survival in new metastatic prostate cancer: date from Southwest Oncology Group Trial 9346 (INT-0162). J Clin Oncol 2006; 24: 3984–90. Nakashima J, Ozu C, Nishiyama T, Oya M, Ohigashi T, et al. Prognostic value of alkaline phosphatase flare in patients with metastatic prostate cancer treated with endocrine therapy. Urology 2000; 56: 843–7. Nishii M, Nomura M, Sekine Y, Koike H, Matsui H, et al. Luteinizing hormone (LH)-releasing hormone agonist reduces serum adrenal androgen levels in prostate cancer patients: implications for the effect of LH on the adrenal glands. J Androl 2012; 33: 1233–8. Yano A, Kagawa M, Takeshita H, Okada Y, Morozumi M,et al. Baseline low serum dehydroepiandrosterone sulfate can predict poor responsiveness to hormone therapy in patients with hormone-naïve prostate cancer with skeletal metastases. Int J Urol 2017; 24: 861–2. Chang KH, Li R, Kuri B, Lotan Y, Roehrborn CG, et al. A gain-of-function mutation in DHT synthesis in castration-resistant prostate cancer. Cell 2013; 154: 1074–84. Yamamoto S, Sakamoto S, Minhui X, Tamura T, Otsuka K, et al. Testosterone reduction of ≥480 ng/dL predicts favorable prognosis of Japanese men with advanced prostate cancer treated with androgen-deprivation therapy. Clin Genitourin Cancer 2017; 15: e1107–15.